S'pore would be happy to sign letter of support, says minister. The following is a doorstop interview with Singapore’s Minister for Foreign Affairs, Mr George Yeo, and the visiting Foreign Minister of Thailand, Mr Khun Kasit. TOC thanks Mr Ephraim Loy for allowing us to publish the transcript and pictures which were first posted on his blog at: http://ephraim.blogspot.com . Minister George Yeo: I am delighted to host Foreign Minister Kasit from Thailand for a simple dinner this evening in my own constituency. He has just been to Malaysia and Indonesia to consult ASEAN colleagues about the situation in Myanmar. We had a useful discussion over dinner. We felt very disappointed by the recent verdict. Even though we appreciated the fact that part of Aung San Suu Kyi’s sentence was reduced, the fact remains that she will still be incarcerated for another year and a half, which means that for the coming elections in Myanmar she would not be able to participate in any way. This is not only unfair ─ we felt that it would go against the spirit of free and fair elections and national reconciliation. Khun Kasit has proposed the idea of ASEAN Foreign Ministers writing a joint letter to the government of Myanmar expressing our disappointment and also our hope that in the spirit of the ASEAN Charter and in consideration that we are a family in ASEAN that they should consider giving her a full amnesty, allowing her to participate in the coming elections and then helping to create national reconciliation in Myanmar. I told Khun Kasit that Singapore will, for sure, be happy to sign such a letter. He told me that both Malaysia and Indonesia are also prepared to. He is now contacting the other Foreign Ministers and getting as many as possible to sign this letter, which we hope will help soften the hearts of the government in Myanmar in reviewing its decision and allowing a process which in the end reaffirms the unity of ASEAN and strengthens the entire ASEAN family. Khun Kasit ..
Thai Foreign Minister Kasit: First of all, I would like to thank Foreign Minister George Yeo for this invitation. I think the acceptance of my coming here was done very quickly, a reflection of the style that we would like to work together; that is, if there is anything of urgency and importance, we should be able to meet as quickly as possible. I think that my presence here is a reflection of that spirit of cooperation and the closeness in the ASEAN family. So once again, I would like to thank George Yeo and his colleagues. Secondly, we are a big ASEAN family and anything that happens in any particular country (which) is of importance, it is incumbent on all of us to find a way out together. It is in this spirit of family togetherness and working together for the betterment of each member country, in this case the situation in Myanmar and secondly for the centrality, strength and advancement of ASEAN which Myanmar is very much part and parcel of. The appeal to the Myanmar government is from fellow family members, that we would like to see national reconciliation and elections that would be inclusive. We do not want any personality or any political groups and so on to be excluded. It is very much in the spirit of the ASEAN Charter as rightly said by Foreign Minister George. The consultation is again part of the way that we do things together ? that anything of importance, we have to consult with one another. I hope that our Myanmar friends would listen that we are not interfering in their internal affairs. I think that the judicial process has been completed which we respect, but I think the commuting of the sentence and the provision of the amnesty is more of a political decision. It would be good for the people of Myanmar, for the respectability of Myanmar as a county, for the cohesiveness of ASEAN together and for the respectability of ASEAN as a whole in the eyes of the international community. I hope to have more consultations with my other ASEAN colleagues, Foreign Ministers, and if need be, I would also like to have interactions with our Myanmar counterpart. Question: I am just wondering Minister, could you clarify if Thailand would be drafting the letter? 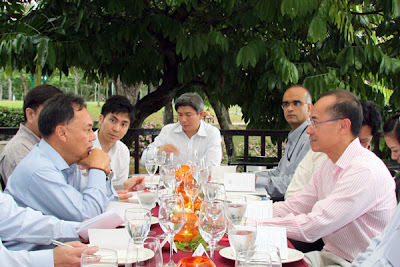 Minister George Yeo: Thailand is in the Chair of ASEAN, so Thailand is taking a leadership role in this regard. We are so happy that Khun Kasit has been applying himself to this challenge. The letter will be drafted by Thailand but all of us will of course give our views. In the end, a letter acceptable to as many Foreign Ministers as possible we hope will be agreed to and sent to the Myanmar government. Question: Is there a timeframe for the letter? 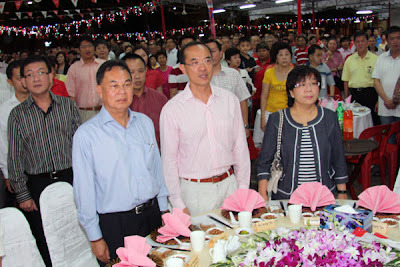 Minister George Yeo: Well. Khun Kasit. Thai Foreign Minister Kasit: As soon as possible. Within this week. Question: Beyond this letter, will ASEAN be taking a stronger position towards Myanmar in any other ways? Minister George Yeo: Myanmar is a member of the ASEAN family and will always be a member of the ASEAN family. For this reason, we should never cut off Myanmar. Our policy is to engage them and through engagement, develop a certain trust and respect as members of a family. It was this trust and respect that enabled us to help Myanmar after Cyclone Nargis as PM Abhisit said two days ago on the BBC, enabling us to build a bridge connecting Myanmar to the international community. That bridge is very important not only to Myanmar and to ASEAN, but also to the world. We should not only maintain this bridge but we should also strengthen it where we can. So while we express our views, more in sorrow than with anger, it is also with affection for the people of Myanmar. Question: Is the anything you would like to add? Minister George Yeo: Let me explain why we are meeting here. 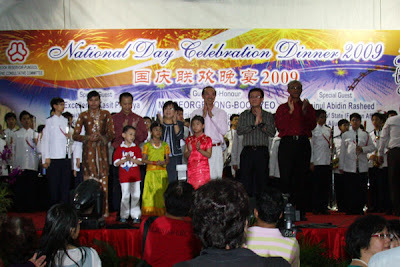 The reason is because when Khun Kasit said that he would like to come to Singapore after Indonesia, I told him, “Look, I am having a National Day dinner at my constituency, so why not we meet just before that and you join us for our National Day dinner?” Half way during [the National Day] dinner, he will be visiting some of our HDB flats as well to see how we live our lives here. We feel so honoured that he should be here this evening in my constituency, and to join us in our National Day celebrations. Question: Mr Kasit, you are only here for a day? Thai Foreign Minister Kasit: Only a day, but I think it is not the number of hours or the number of days that matters. It is the programme itself. I would like to see democracy at work very much at the grassroots level. To be here with Foreign Minister George in his constituency and to meet ordinary Singaporeans, as a politician, I think that this is something wonderful. Question: Where will you be going after this? Thai Foreign Minister Kasit: Tomorrow, I will be going to see the new Marina Barrage as well as the Harmony Centre to see multi-cultural activities, which is very useful for us in our deliberations on how to find solutions to the problems in the southern part of Thailand.